Iran has launched airstrikes against Islamic State militants in eastern Iraq in recent days, the Pentagon confirms. According to spokesperson Rear Adm. John Kirby, the strikes were not co-ordinated with the US military and may be the first of their kind. "We have indications that they did indeed fly airstrikes with F-4 Phantoms in the past several days," Kirby told AFP. It may be the first time Tehran has launched manned aircraft from inside Iran to strike Islamic State (IS, formerly ISIS/ISIL) targets in Iraq, Kirby told AP. He said that while the Pentagon has conducted its own airstrikes in Iraq, it had not co-ordinated the attacks with Iran. The US and Iran have had unfriendly relationships since the Islamic Revolution in 1979. A senior Iranian official, who spoke to Reuters on condition of anonymity, has denied reports on the recent airstrikes against IS targets in Iraq. "Iran has never been involved in any airstrikes against the Daesh [Islamic State] targets in Iraq. Any cooperation in such strikes with America is also out of question for Iran," the senior official stated. Meanwhile, Foreign Ministry spokeswoman Marzieh Afkham said she "cannot confirm this information on military cooperation [with Iraq]." "We provide military support and advice in the context of international rules," AFP quoted her as saying. Since August, a US-led coalition has launched a number of airstrikes against the IS. However, the US has previously maintained it "would not be appropriate" for Iran to join the fight. The presence of Iran in a coalition to fight IS militants ''would not be right for any number of reasons,” US Secretary of State John Kerry said in September. On Wednesday, John Kerry is set to host the first high-level meeting of the 60-member coalition at NATO headquarters in Brussels to discuss military strategy against the IS. 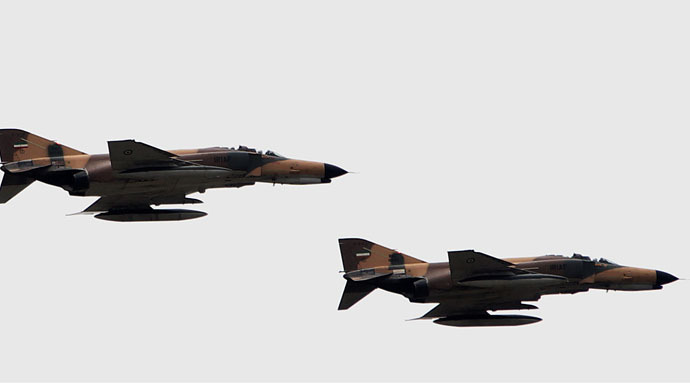 Kirby's comments followed Al Jazeera footage of what appeared to be US-made F-4 fighters, similar to those used by the Iranian Air Force, attacking targets in the eastern province of Diyala. Kirby said the US continued to fly missions over Iraq and it is up to the Iraqi authorities to avoid conflicts in its own airspace. "We are flying missions over Iraq, we coordinate with the Iraqi government as we conduct those. It's up to the Iraqi government to de-conflict [sic] that airspace."